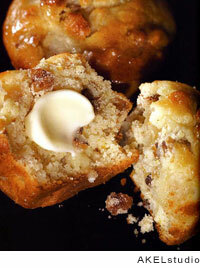 Incredibly flavorful, moist wonderful muffins. These have just barely enough gluten developed to hold them together. Don’t hesitate to stir this batter vigorously before you add the cream, pears, and nuts. If your first batch of these muffins is too tender and crumbly, you can solve the problem next time by adding the buttermilk alone to the flour mixture before you mix in the oil and eggs. This will develop more gluten to hold the muffins together well. These unusual roasted walnut and pear muffins from Shirley O. Corriher are moist and crunchy and rich and healthful all at once. 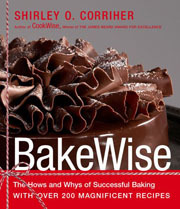 As far as we’re concerned, Corriher is the Queen of food science. No further discussion necessary. 1. Arrange a shelf in the lower third of the oven, place a baking stone on it, and preheat the oven to 350°F (175°C). 2. Spread the nuts out on a baking sheet, place in the oven on the stone, and roast 10 minutes. While nuts are hot, stir in the butter and 1/4 teaspoon salt. When cool, coarsely chop and set aside. 3. Turn the oven up to 425°F (218°C). 4. In a large mixing bowl, beat together the flour, baking powder, the remaining 1/2 teaspoon salt, and the sugar for a full 30 seconds. 5. In a medium mixing bowl, beat the egg yolks and egg a few strokes, then beat in the oil, buttermilk, vanilla, and orange zest. 6. Make a well in the dry ingredients and pour in the wet ingredients. Beat with a hand mixer or by hand with a fork. Stir or beat well. Stir in the candied ginger. This batter is almost too tender, so do not hesitate to stir vigorously. 7. In a cold bowl with cold beaters, whip the cream until soft peaks form when the beater is lifted. Beat just a little beyond this soft peak stage. By hand, stir about one-quarter of the whipped cream in to lighten the batter. Then fold the rest of the whipped cream into the batter. Fold the pears and walnuts into the batter. 8. Spray two 6-cup medium (2 3/4 x 1 1/8-inch) muffin pans with nonstick cooking spray. If you make muffins in a pan that is a different size than the recipe indicates, you will need to adjust baking time, and the yield will be different. 9. Fill the muffin pans almost to the top. Sprinkle some coarse sugar on top of each muffin. Turn the oven down to 400°F (204°C) and leave the oven door open for about 10 seconds. Place the pans into the oven on the stone and close the oven door. Bake until well-risen and lightly browned, about 20 minutes. 10. Cool the muffins in the pans for about 5 minutes. Jar the edges of the pans on the counter to loosen the muffins, and carefully remove them to a cooling rack. Pear and Walnut Muffins Recipe © 2008 Confident Cooking, Inc. Photo © 2008 Photigy. All rights reserved. All recipes and photos used with permission of the publisher.